Explosions! Dynamite! Cannon Fire! Cannon Fire? 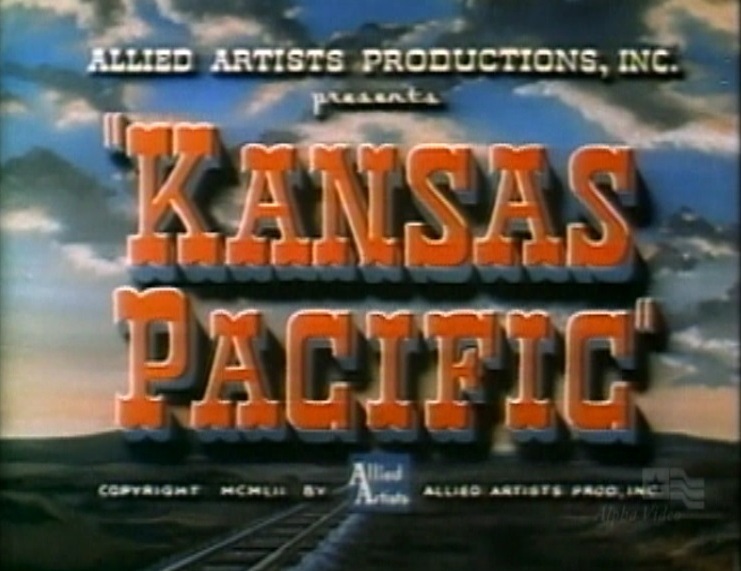 Kansas Pacific 1953 has it all in glorious Cinecolor. 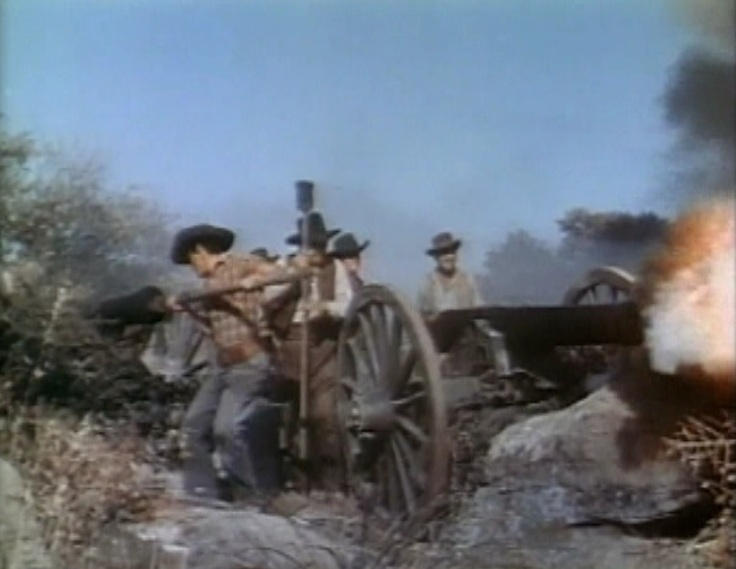 An action-packed, pre-Civil War western staring Sterling Hayden as the two-fisted Captain John Nelson. Brought in to restore order during the construction of the Kansas Pacific Railroad, Sterling Hayden starts out by joining in a brawl outside the railroad’s offices (just to set the tone). Hayden must battle a ruthless gang of Confederate sympathizers who are trying to keep the railroad from being built through to Yankee territory. 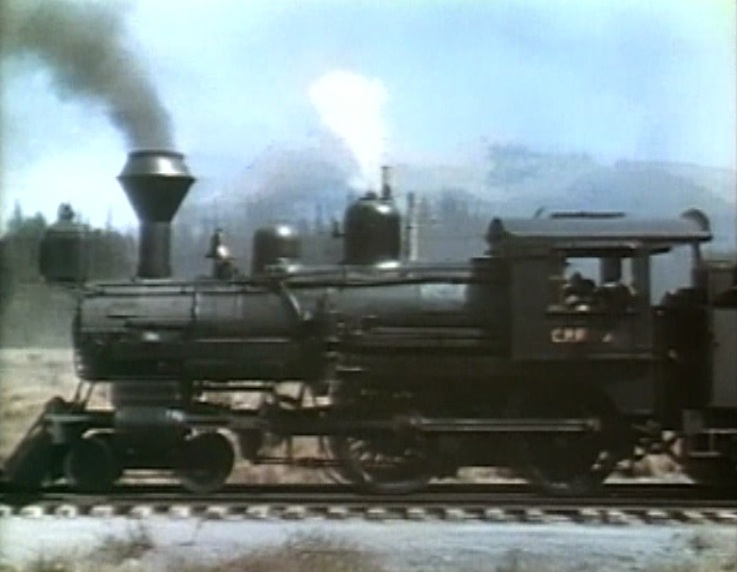 One of the stars is the famous Sierra Railroad #3, a 4-6-0 Rogers product of 1891. #3 is blacked out from cowcatcher to tender (no number or markings visible), but is seen in company with the two “short” passenger cars (combination #5 & coach #6) as well as a carry-all flatcar. K A N S A S P A C I F I C R. R. is painted in huge letters on the coach — in case you forget which railroad is being built. 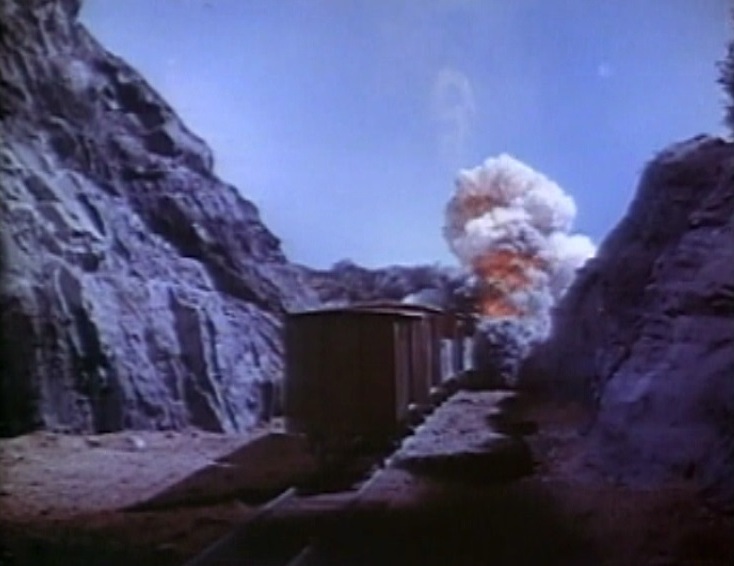 While Sierra #3 waits patiently, Sterling Hayden and the engineer hustle up front to move boulders placed on the tracks by the bad guys. Apologies for the fuzzy pictures — my DVD print is not the greatest. 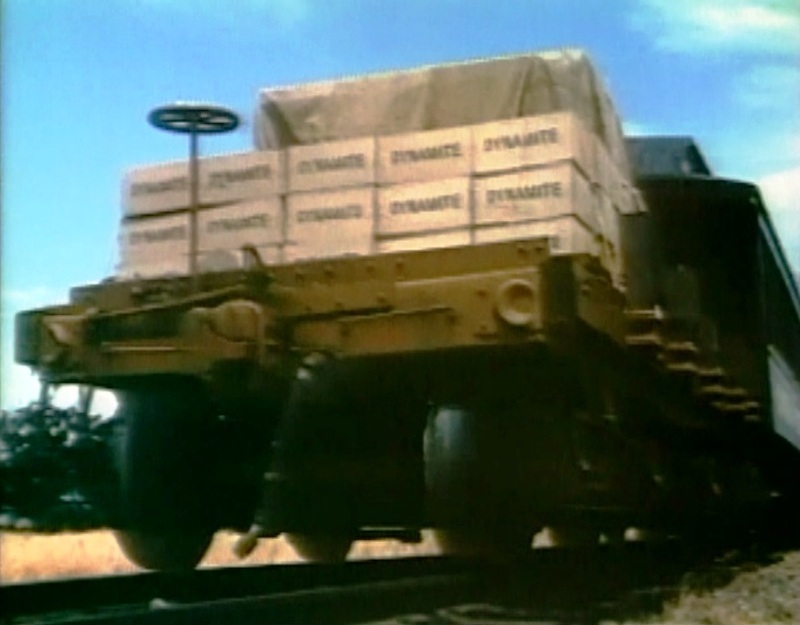 Laying rails on the prairie (with towering mountains in the background); Hey, let’s place the dynamite in unsecured boxes on the end of a moving flat car. That should be safe enough, right? 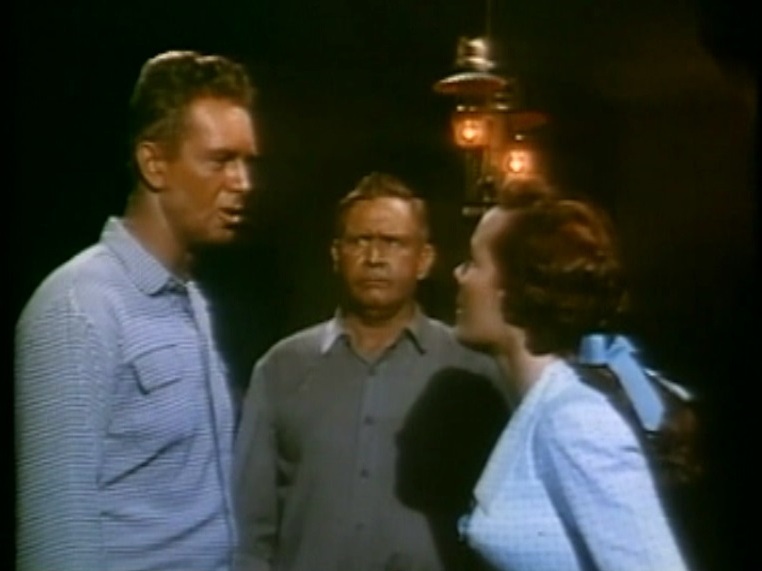 Sterling Hayden gets off on the wrong foot with the boss’s daughter (played by Eve Miller) as Barton MacLane (the boss) looks on; Irving Bacon provides comedy relief as the station agent. 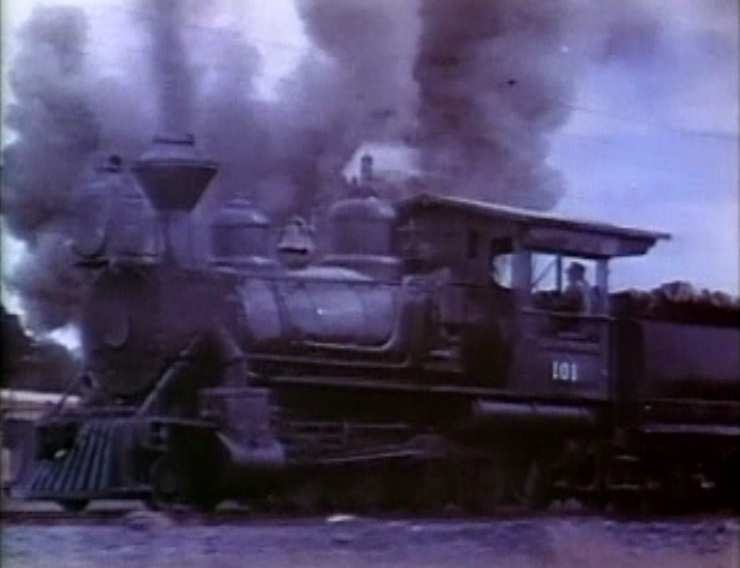 Halfway through the picture, there is a brief view of this little 4-4-0 tea kettle with what appear to be CPR (Central Pacific? Canadian Pacific?) 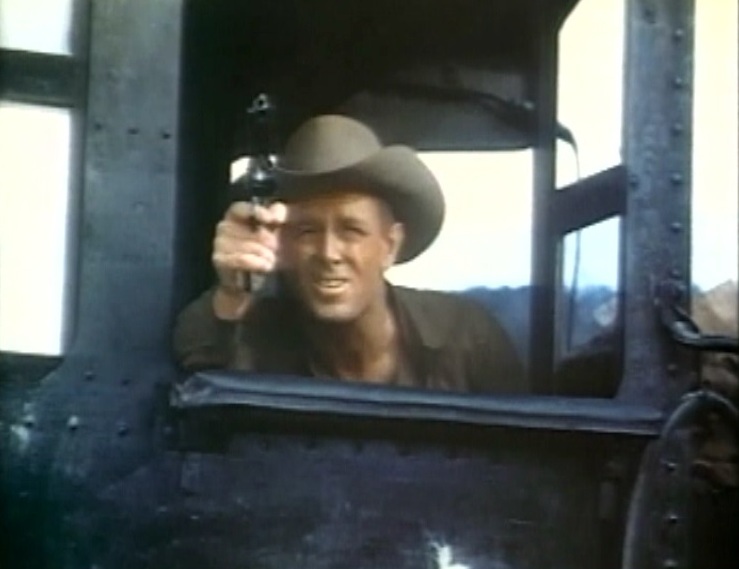 markings on the cab; Sterling Hayden shoots it out with the bad guys from the cab of Sierra #3. Somehow, despite all the sabotage, the K.P. line is completed. 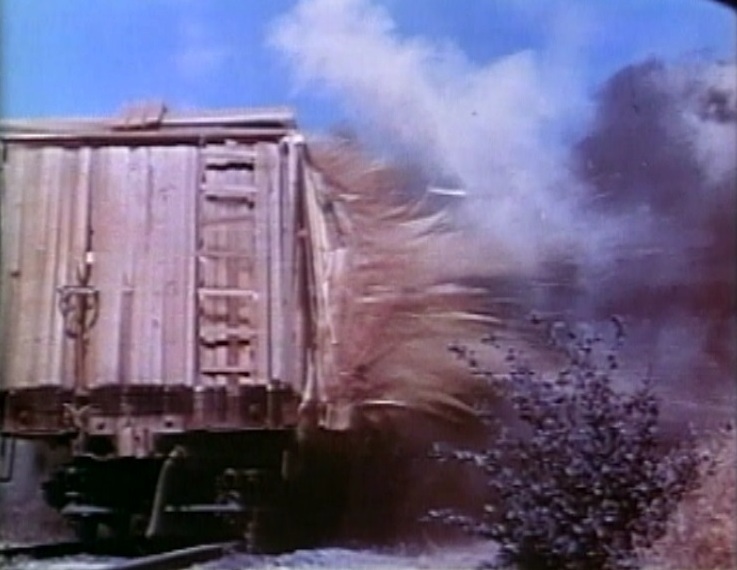 The villians now employ trackside cannons (with remarkable accuracy) to literally blow up the fast-moving freight trains. 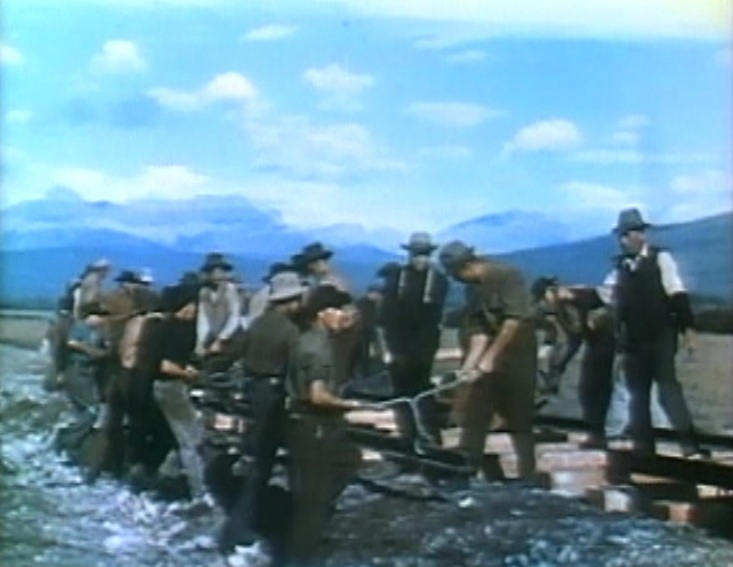 Sensational footage, but maybe a bit over the top, even for a Western. Commence firing! 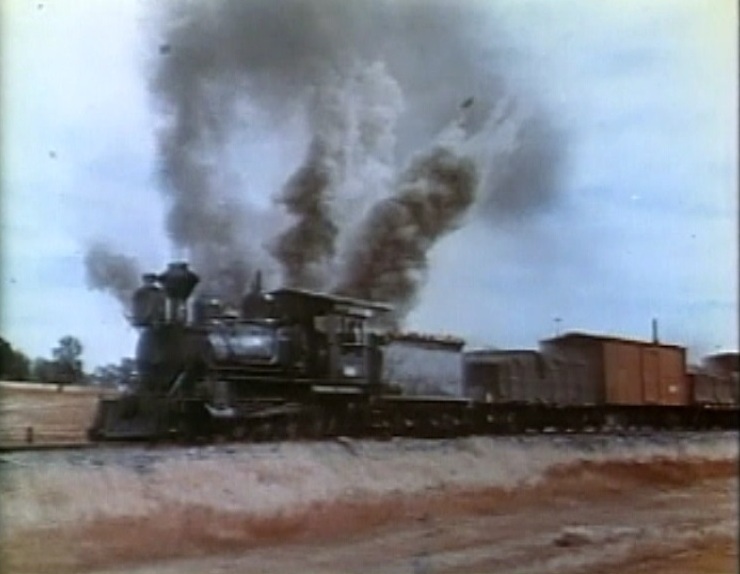 ; A Sierra Railroad 2-8-0 locomotive (they had several) dodges cannonballs at full gallop. 2-8-0 #101 close up, with bombs bursting in air; Uh-oh, looks like #101 took a direct hit with resulting gratuitous fireball. 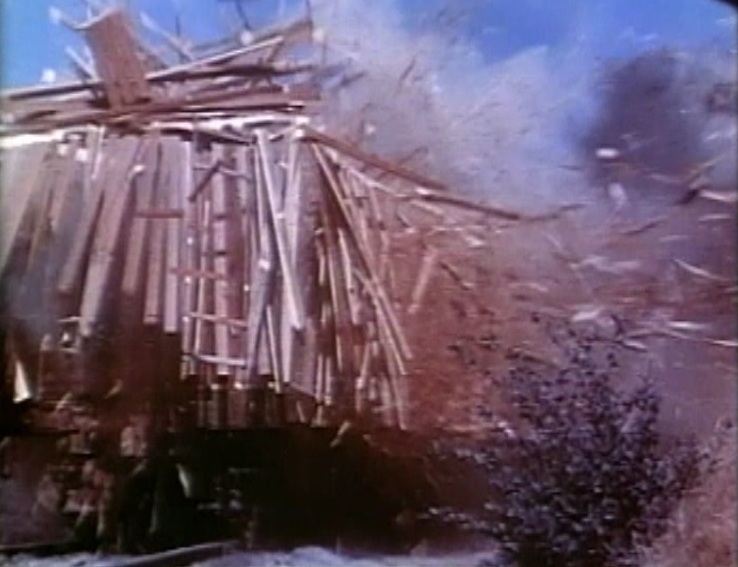 Watch as a wooden box car disintegrates from the deadly accuracy of the bad guy’s artillery barrage. Well. 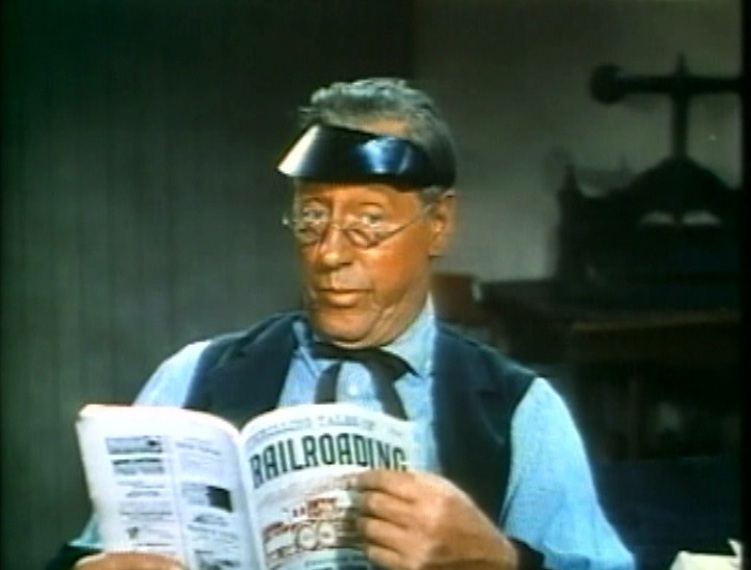 The railroad’s not going to stand for all this chicanery. In short order, they set up an ambush of their own, call in the army, have it out with the cannon-toting villians and round up the entire gang. After a spectacular fist fight, of course. 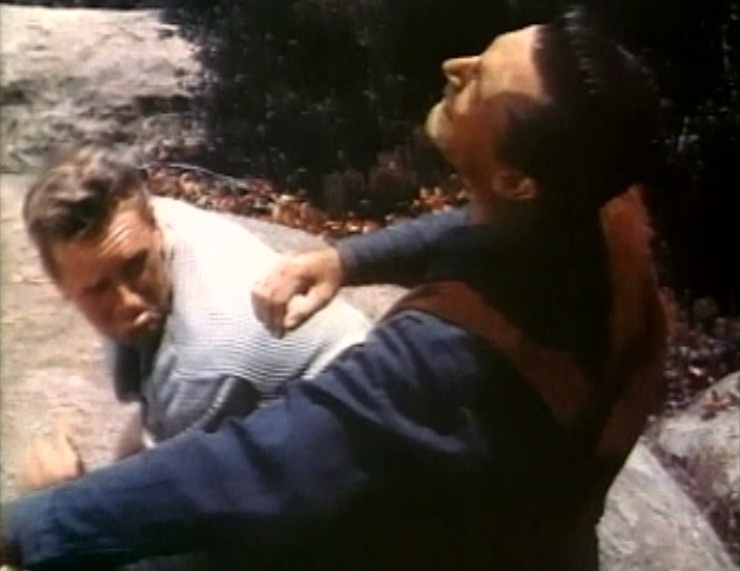 Sterling Hayden lays out the gang leader with a left haymaker, then gets the girl by the station as a Kansas Pacific coach looks on. Was there ever any doubt? 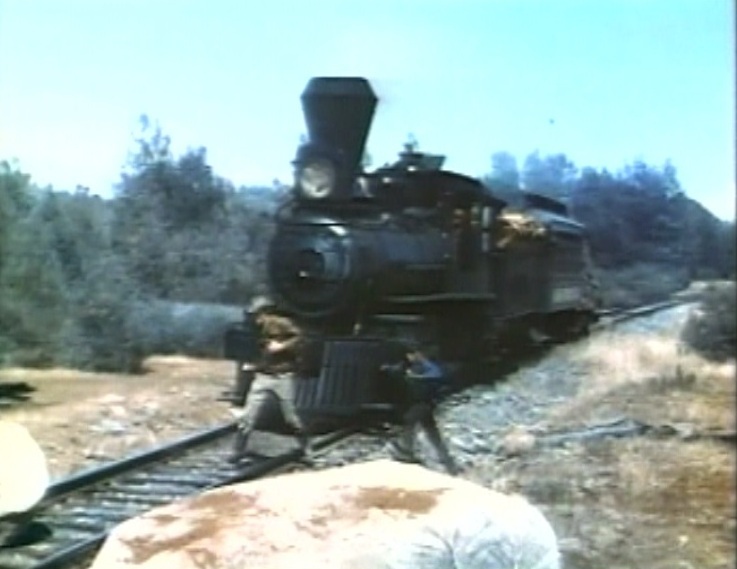 All in all, an enjoyable little B western with lots of train action. 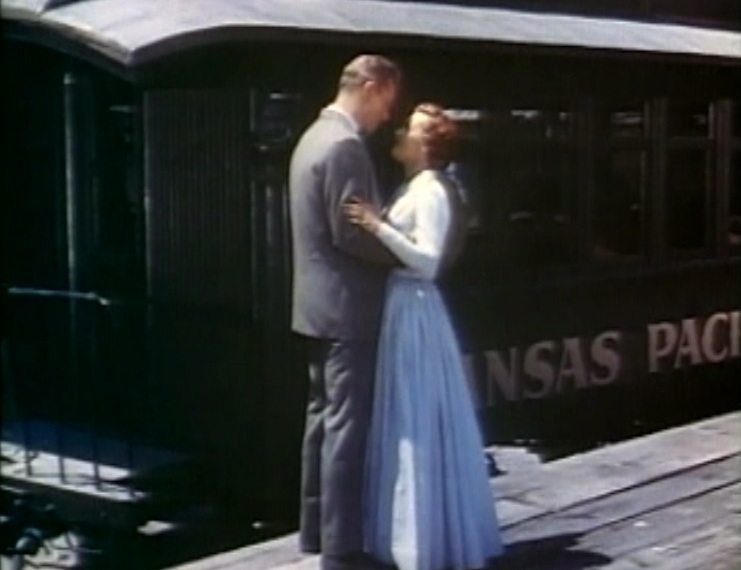 This entry was posted in Uncategorized and tagged Barton MacLane, Kansas Pacific, Kansas Pacific Railroad, Sierra Railroad, Steam Locomotive, Sterling Hayden, Western. Bookmark the permalink. Ah, the old “boulders on the track” ploy. A classic! I like how the boulders are perfectly round and don’t match any of the nearby terrain. Geological anomaly! !